Following Demeter in June, Parasol, the second-up in the Myriade microsatellite series, is preparing for launch. Parasol will study the impact of aerosols and how they interact with clouds to give scientists a better understanding of Earth’s climate system. But it is not undertaking this mission alone. Operating in formation with 5 other satellites, Parasol will be one component of an orbital observatory designed to probe the atmosphere from every angle, heralding exciting times ahead for climate researchers. Aerosols and clouds block out the Sun’s rays, thus acting as a parasol to cool the Earth-atmosphere system. Conversely, greenhouse gases and clouds prevent infrared radiation emitted by Earth from escaping back into space, which produces a heating effect. To what extent does the parasol effect counteract the greenhouse effect? What final impact do these competing effects have on the planet? These are some of the questions the Parasol mission will attempt to answer. The Parasol payload draws extensively on the heritage of the POLDER instrument. What is new about its mission, however, is the role it is expected to play in a unique space observatory known as the A-train. 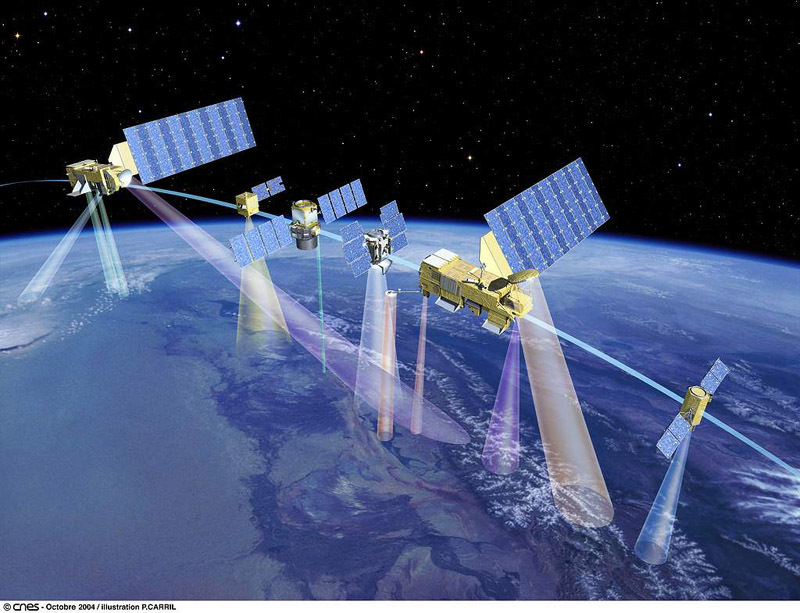 This formation of 6 French-U.S. satellites will be able to observe the same atmospheric phenomena within minutes of each other, looking at different physical characteristics. After separation from the launcher, Parasol will manoeuvre under its own thrust to join its companion satellites: Aqua and Aura, already in orbit, and Calipso, CloudSat and OCO, to be launched in sequence from 2005 onwards. The satellites will be like the carriages of a train, trailing each other by a few minutes or seconds (just 15 minutes between the lead satellite and the last in the train). Parasol is currently undergoing final tests in Toulouse. The launch campaign will get underway on 26 October in Kourou, French Guiana, in readiness for launch by an Ariane 5 in December. Parasol is a satellite that definitely likes company, since the launch will also be lofting 5 other passengers! Sitting on the launch adaptor with its co-passengers, Parasol will be the last to be injected into near-circular orbit at an altitude of 705 km. 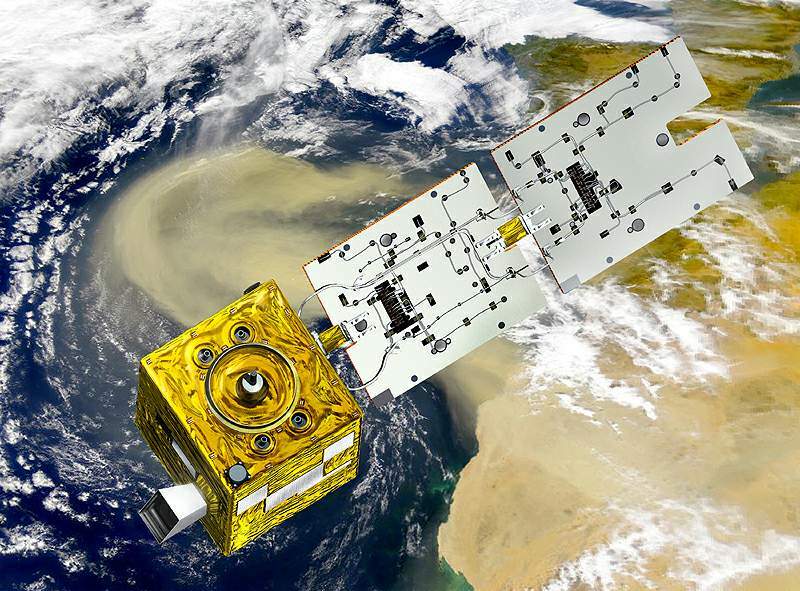 CNES will perform positioning operations for all 6 satellites: the Helios IIA military satellite, to be positioned with respect to its predecessor Helios IB; the 4 microsatellites in the Essaim formation; and Parasol in the A-train. An unprecedented, ultra-precise orbital dance choreographed by operations teams.